Singing together can be an emotional experience. As churchgoers, choir singers or sports fans raise their voices as one, they feel connected. Turns out, that connection may have a physiological foundation. 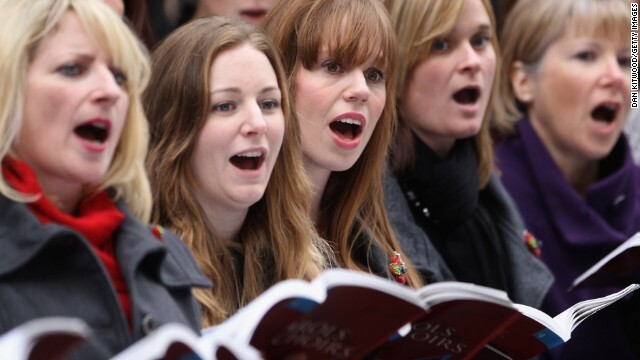 A small study suggests people who sing together have synchronized heartbeats. Singers often inhale and exhale at similar times. When your heartbeat is connected to your breathing pattern, it’s called respiratory sinus arrhythmia, or RSA. RSA can have a soothing effect on the cardiovascular system. For instance, past studies have shown guided breathing – like what’s done in yoga – can be beneficial for high blood pressure problems. “If this is correct, singing would probably have the same effect,” said Bjorn Vickhoff, a professional singer/songwriter-turned-neuroscientist at the University of Gothenburg in Sweden. Vickhoff is fascinated by music’s effect on the human body. He hopes to eventually find new ways music can be used in medicine, rehabilitation and preventative care. His latest study, published this week in the journal Frontiers in Psychology, focuses on how song structure can affect a singer’s heart rate. Vickhoff and his colleagues gathered 15 healthy 18-year-olds at a high school in Gothenburg. They had the group perform three different choral exercises while recording the heart rates of each person. The first exercise was monotone humming, where the participants were told to breathe as needed. For the second exercise, the teens sang a popular Swedish hymn and took breaths whenever. The third exercise was a slow mantra; participants were instructed to breathe only between the long phrases. These three exercises allowed the researchers to see how coordinated (the mantra) and uncoordinated (humming) song phrasing affected the participants’ heart rhythms while they were singing. The researchers found that each singer’s heartbeat was linked to the song’s melody – i.e. the speed and structure of the music. They also found that when the choir sang together, their heart rates tended to increase and decrease at similar times. “As soon as the singing begins, (the hearts) start following each other,” Vickhoff told CNN in an e-mail. Humming and performing the mantra as a group resulted in more synchronized heart rate variability, or HRV, than singing the hymn. “The impression is that the heart cannot completely follow the respiration (guided breathing) when it has a more complex, hierarchical structure,” the study authors wrote. Four of the heart rate monitors malfunctioned, so only 11 sets of data were collected and analyzed. That’s a very small study sample to make any steadfast conclusions. The study will have to be duplicated with more participants. The researchers did not look at whether the increased HRV had a positive effect on the study participants. And any effect would be temporary, Vickhoff said. Vickhoff likes to go beyond what his study analyzed to talk about the possible implications for this kind of music-body connection. In the journal article, he discusses the evolutionary question of why music is a universal phenomenon. “David Huron, the cognitive musicologist, has suggested that music promotes bonding, and thus strengthens groups, which would have a survival value,” he said. The study authors note that breathing together, whether it’s through meditating, praying or singing, is done in most religions. This theory is not all that surprising, considering that merely listening to music tends to synchronize the listener's heart to the beat of the music. It has been known for a long time that shoppers tend to shop in pace to the music played. So, it is not surprising that something that connects a person as intimately to music as singing does would synchronize the singer's heartbeats. Probably true. Just listen to an all womans choir, It's magical!! How special. I feel all warm and fuzzy after reading this. Gee. More proof that the heart rate increases when we inhale, and decreases as we exhale. Amazing that it also happens when we do it at the same time? Zzzzzz. Singing is not merely inhaling or exhaling. It's producing a deep emotional & spiritual connection through music.It also affects you physiologically & intellectually. You become very connected to people when you perform music together. That goes for ANY music group : rock ,jazz, classical, bands, orchestras, choirs, backyard groups & country music. I've been a choir singer & church soloist , since childhood : childrens' church choirs,adult church choirs, gospel choirs, opera choruses, been on international choir tours & performed great classical choral works with famous orchestras & conductors as a member of world class symphonic choirs. I have made & kept many close friends thru these choirs & performances. The power of music is such that music therapy is a recognized professional therapy for people who are injured, depressed, have PTSD, or are otherwise impaired. In fact, music therapy was used to help Gabby Giffords ( the Congresswoman shot in the head) start regaining her speech & motor skills. In fact, music is so rooted in the brain that many times,Alzheimers patients who no longer recognize family members & can't care for themselves, respond to music & start to become alert & can often sing old songs they grew up with. I have witnessed this. Your reply suggests that you have missed out on the glorious spiritual power of music.. How very sad. I was a choral director for nearly 40 years, and this doesn't surprise me whatsoever – choral singing is all about establishing strong relationships and the heart is definitely involved in that. I'm a very proud member of MUSE, Cincinnati's Women's Choir and I wholeheartedly agree with this article. Singing with my sisters is better than any therapy! Choral singing is the ultimate spiritual high. It's the best kind of team work. To be a truly great choir requires attention, awareness, listening, and connecting on all levels. There are no greater friends in the world than those you commit to sing with on a regular basis. If only this country would prize choirs (and the overal art & beauty of real music, not the trendy pop/rap/ country nonsense you hear on the radio chain stations) as much as the rest of the world does. Don't try to pump up your preference by denegrating the preference of others. I sang in the Cincinnati Boychoir and church choirs as a young man so I do appreciate the choir genre, but it is not a style for all times and all people. Can't imagine listening to that on the beach any more than I can imagine death metal in a formal concert hall. I understand and thats why group meditation is so strong. Even though we are silent, there is a connection between us that one can feel. Its a magical feeling that instills peace, love and kindness into everyones hearts. Is that Tonya Harding on the far right? Maybe if Congress would just sing together 'Oh, Beautiful ,for spacious skies..'at the start of each session, we would get things DONE. And I'm not even joking.